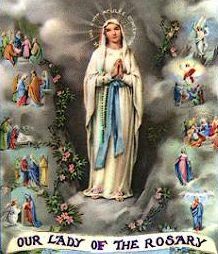 How to pray the Rosary (link) – with prayers included. Let us call on Mary, & ask her to help us to cooperate with God’s grace, as she did. May we open our hearts to Mary, so she may daily lead us closer to God. We are in need of prayer. The rosary combines Scripture and a simple exploration of the Life of Christ. May Mary and the Holy Spirit guide you into a deeper knowledge of Christ, His Life, & His Love. This entry was posted in Catechesis and tagged Dr. Margie Crooks, Jesus, life, love, Mary, October, Rosary. Bookmark the permalink.